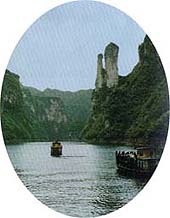 Along Xiang-Qian Railway to the southeast of Guizhou province. 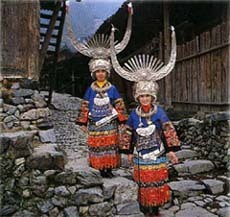 Kaili city is the capital of Miao and Doug minority autonomous region and the central tourist city in westeast part. There are seven different ethnic stockades in the southeast part of Ian which center on ethnic custom, the neighbor being Wuyang River scenic resort district, Fanjiang(Pure)Mountain natural reserve district, the Dragon Cavern in famous Zhenyuan city, the Nine-Dragon Cavern in Tongren, etc. 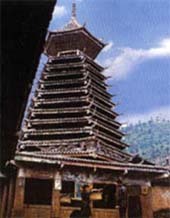 With unique architectural structure in Doug ethnic region, Dong Stockadc Drum Tower serves as u public site for villagers' sacrificial events, festival rally and leisure. A firing pool is arranged in its center with long benches and armchairs all around, a skin drum on its top and a Don, opera stage opposite to it. The tower resembles China fit in its outer form, with some reaching as high as more than ten storeys, over 20 min height. The Doug Ethnic Wind and Rain Bridge, also named as the Flower Bridge. straddles the Dona Stockade River. It is of the traditional structure of Dong nationality. On the bridge, there are corridors and towers with long benches inside for passers-by' rest and shelter from rain, as well as for traffic and dancing recreation purposes. The Miao and Dong Minority Autonomous Prefecture to the Qian enjoys numerous ethnic festivals with different styles, including Dragon dance Festival (15th of the I st lunar month). Dragon Dugout C Dragon Lantern Festival, lusheng (bamboo music entrustment) meeting, Sisters Festival, Eating Fresh Rice Festival, Torch Festival, Miao Ye; be said: "Customs and styles are different in a short distance grand festivals occur every three day while minor ones everyday customs and practices and ethnic dietary culture can be appreciated here. Zhengyuan Dragon Cavern is a architectural group of the M consisting of six parts(Dragon Cavern, Ziyang School. Zhongyuang Yard. Longevity Palace, Prayer Bridge and Lotus Blossom Pavilion. It erect upright relying on cliffs with wonderful layout and elegant skills. As a national level scenic resort, Wuyang river includes upper and lower Wuyang Canyon, Yuntai Mountain, Heichong, China Fir River, Flying Cloud Cliff and the famous Zhengyuan city of historic and cultural. It is renowned for its canyon, floating in torrent. Ancient temple and architecture. And ethnic customs and practice. Lying on lofty and precipitous peaks, the China h it Resort district is featured in its rows of peaks and floating clouds and fog with an imposing manner. Its riverbed is paved with pebbles. The whole surrounding is secluded and safe and may be said:?we don? known the clean stream of the river without diving in it." Located to the border among three counties, Injiang, Jiangkou and Songtao, Fanjing Mountain is a national natural reserve. It is the main peak of Wulin ridge with an altitude of 2494tn above sea level. In it, there are rows of peaks, many of which are green-capped, and tower high with overhanging precipices and steep cliffs, presenting a picturesque scene. Inside its virgin forests, there are precious animals and plants, golden monkeys and dove trees, etc. Since the Ming Dynasty, Buddhists cut mountains to build numerous temples there, making it a holy ground.